Well the light was a bit better, but my Ikea-i-fied DIY light shelf makes that irrelevant. 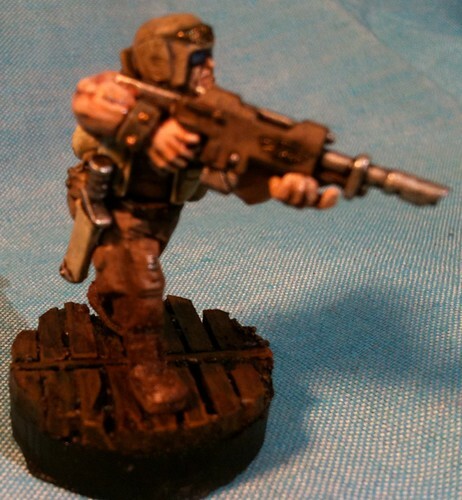 I took more pictures of the two models on which I did the blood and gore, Lonewolf style, and put some dirt on the pants and boots of the Imperial Guardsmen. I need to work on my weathering more, but it is a start. I’ll seal them and be done with it. Today is a nice day in Vancouver, but I have a movie to watch that I rented yesterday. After that I plan to return it, walk up to Darren’s store and order one of the new Blood Angel special characters, he’s becoming a Khorne Raptor champion sometime after Astronomi-Con Vancouver. I will start my terrain project today, plus keep looking for work. In the mean time I updated one of the many cool webpages I’ve put up over the years featuring models from the Diseased Sons. 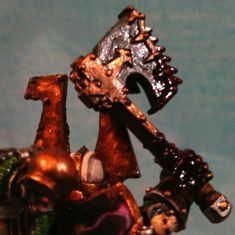 Check it out if you’re interested in the history of Nurgle in 40K. As is now the status quo I put finished shots of the minis up on Flickr and hotlinked to them. Eventually I started a miniature painting blog to handle content like this because I tried to make this blog more professional and focused. You’re still welcome to leave a comment below. 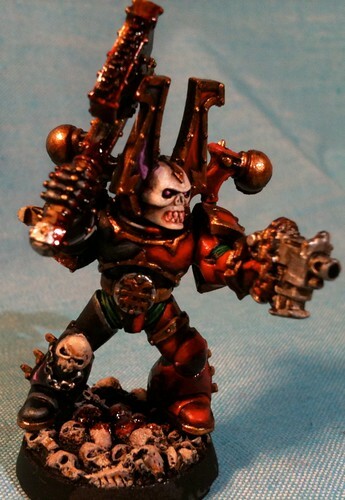 This entry was originaly posted on April 8th, 2010 , it was last edited on March 18th, 2019 and is filed under: Gaming and tagged: 40K, Astronomi-con, Imperial Guard, Khorne, Miniature Painting.